Like the finer things in life? The new Maserati Quattroporte Saloon translates as four-door saloon” – but sounds and feels so much better in Italian. In 2017, it’s kept its elegant heritage, but has added to it with sharper handling, sharper looks, and knife-edge performance. It’s the quintessential romantic Italian saloon for the suave and sophisticated driver. 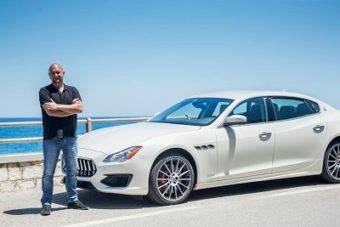 Maserati realised that the Quattroporte was starting to sell better than ever in recent years, and added more engines to capitalise on this newfound popularity. This means you now also get the option of a more efficient and economical diesel engine. Just in case you don’t fancy one of the blistering petrols that do 0-62 quicker than a Porsche 911. Intrigued? OSV takes a closer look at what it’s all about with our 2017 Maserati Quattroporte Saloon review. Luxury saloons always weigh at least two tonnes, and this one is no different. Add a weighty Ferrari-developed 523bhp V8 petrol engine, and you’ve got a bit of a beast on your hands. Despite this, it can do 0-62 in just 4.7 seconds. To put that into some perspective, that makes it quicker than a base-level Porsche 911 sports car. It’s truly an engineering miracle. There is also the option of a smaller V6 engine which is almost as fast. In fact, its performance is virtually on par with the V8 and both will get your knees wobbling. The only real difference between the two is that the sonically-dramatic V8 engine sounds more thunderous. Both engines feel lightweight, which ensures they’re agile and nimble in bends. The steering is super responsive, and all in all the Quattroporte feels like a smaller car. That said, choosing the 21” alloys over the 19” ones will change all that. 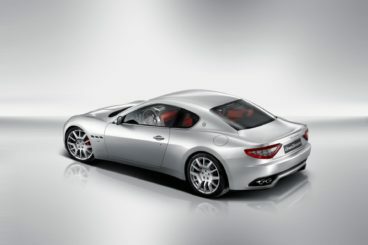 Maserati have added a diesel engine this time around. Despite its improved economy, we just can’t see this 3.0-litre unit attracting too many fans. For a start, it doesn’t have the same hair-raising engine note of the petrols. Maserati tried to solve this problem by adding an Active Sound generator, but it just didn’t work. However, if saving cash at the pumps is one of your goals, there is nothing wrong with it per say. It also has a terrific mid-range bite. It’s also slower and smaller, too. It delivers 271bhp, and does 0-62 in what seems like a plodding 6.4 seconds. It’s also not responsive, and feels somewhat artificial. Body control is good whichever engine or driving mode you choose, though. 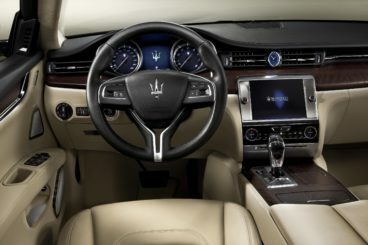 The Maserati sports a high-quality interior, though it isn’t quite class-leading. Upmarket wood, metal and leather are used throughout, while the ergonomics have got better. All the dials and controls are logically arranged, but some buyers might be turned off by the conservative styling. It lacks adventure and excitement overall. We also have an issue with the ride quality. On the weaving, smooth roads of Montenegro, the Quattroporte probably feels like you’re riding a magic carpet. On the fissured roads of broken Britain, the car judders and jiggles like a cheap Hatchback. It’s not exactly becoming of a luxury saloon. Still, Maserati have compensated a bit with their nicely cushioned and well-shaped seats. Insulation has also been improved. So while you might feel the broken roads, you might not hear them. Interior space is good, too. The Quattroporte has been lengthened considerably, something that’s clear once you sit down. Legroom is excellent. Headroom in the rear is still an issue, thanks to the low roofline. But we expect there to be less complaints than last time. You can stick to the three-seater back bench, or you can add an elegant two-seater, complete with a large central armrest. The boot, meanwhile, measures 530-litres, making it 80-litres bigger than last time. The list price is high, but you get a lot of bang for your buck. Standard kit is lavished upon the car, and includes full leather upholstery, climate control, sat nav, and alloys. Optional extras include the likes of a carbon-fibre and wood steering wheel Alcantara suede on the roof lining, and three-zone rear seat heating. Also included are LED daytime running lights, an 8-speed automatic gearbox, a chrome exterior trim, and heated exterior mirrors. Bluetooth and keyless entry is also included. Where safety is concerned, it’s unlikely that the car will ever be put through its paces by Euro NCAP. Its standard safety kit is reassuring, though, and includes plenty of airbag’s and a tyre pressure monitor. You also get active cruise control and electronic stability control. Prices for the new car start out from £70,800 and rise to £116,800. If you prefer to lease, you can pick up a deal from around £900 + VAT per month. For more information on our leasing deals, check out our page here. In terms of its running costs, downsizing from a 4.7-litre V8 to a 3.8-litre V8 engine has helped the Maserati be more affordable. There’s no denying that it will still cost a pretty penny, but returns of 23.7mpg are better than last time. Meanwhile, emissions of 274g/km of CO2 yield a yearly tax bill of £505. Alternatively, you could go for the less powerful 3.0-litre V6 engine, which returns 26.9mpg and costs £490 a year in tax. 0-62mph in 4.7 seconds for such a big car is impressive. Italian panache is the order of the day for a car that just oozes class. Upmarket leathers, woods and metals are used throughout in what is an impeccable interior. All cars in this class depreciate badly. But the Maserati has historically depreciated worse than most. After three years of ownership, don’t expect to hold onto more than 28% of its original value if you go for the GTS model. It’s cheaper on the road than last time, but still only returns 23.7mpg at best. Let’s see how the car fares against its rivals in the comparison section of our 2017 Maserati Quattroporte Saloon review. 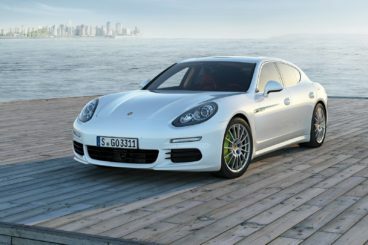 The new Porsche Panamera is a true Porsche in every sense of the word: Beautiful, heart-poundingly fast and luxurious. It’s a Porsche for the real world, in the sense that it’s got five doors and is largely family oriented. But despite its Hatchback conventions, it’s got a lot to offer keener drivers who just want to have some fun now and then. On winding country roads, the Panamera is a joy to behold, its large dimensions proving to be remarkably compliant. It’s effortless on the motorway, and makes overtaking look easy. And if you go for a four-wheel-drive model, you benefit from a huge amount of grip. In terms of the engines, the entry-level turbocharged 2.9-litre petrol engine will be more than enough for most buyers. It produces 325bhp, does 0-62 in 5.7 seconds, and can be specified with four-wheel-drive. The 4S model tops power up to 434bhp and does 0-62 in 4.4 seconds, while the Turbo model adds a crushing eight-pot 4.0-litre engine. This bad boy develops 524bhp, and does 0-62 in less than 4.0 seconds, not stopping until 190mph. Those seem like crazy numbers for a car that’s billed as a Hatchback, but adding the Sport Chrono package boosts them even more. Running costs will naturally be unforgiving. The 2.9-litre petrol engine is the cheapest model to buy outright, and rents 37mpg while emitting 178g/km of CO2. From there, the numbers plummet sharply. But with such bombastic performance on offer, that was to be expected. That said, the Turbo is the most expensive to run, and it can return 30.1mpg, which seems reasonable. Inside, you’re greeted by a truly beautiful cabin. It’s well-appointed, the seats are comfortable and the evergreen design is timeless. The rev counter has been switched back to analogue in a nod to days gone by, while the dash gets two new high-res digital dials. However, the controls overall are a tad fiddly for our liking. The central air vent, for example, is configured by an awkward menu system. There is a short and a long wheelbase available, with the latter offering enormous interior space. Those in the front will especially benefit from the sheer amount of legroom on offer, but comfort is good throughout. It’s actually remarkable that a car that can keep going until 190mpg is so practical. Rear seated passengers are treated well. But if you want to really spoil them, the £3,039 all-round ventilated massaging seats are worth adding. The boot, meanwhile, measures 495-litres, which is competitive for this class. Fold the rear seats, and you can extend it to 1,304-litres. The new Lexus LS Saloon is luxurious, comfortable, well-equipped – but it isn’t one for keener drivers. It is, however, a proper practical exec car. Just two engines are available – a petrol and a petrol-electric hybrid. 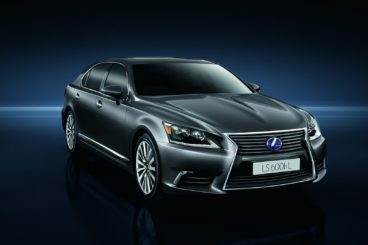 The 4.6-litre LS 460 petrol model replaces the dated LS 400, and can get you from rest to 62mph in 5.7 seconds. It’s rapid in a straight line, but despite all that performance, it isn’t much fun to drive. The hybrid is a longer wheel base model that gets four-wheel-drive as part of its standard package. It’s got lots of grip, but its batteries just add to the Lexus LS Saloon’s already formidable weight. As such, you will feel that weight, especially in bends and at speed. Worse still, it’s paired up with a hesitant and slow CVT automatic transmission. It’s not cheap to run either, its sheer weight forcing down running costs. Expect to return 32.8mpg at the absolute best. The petrol model, meanwhile, fares only slightly worse. And because it’s cheaper to buy, it actually makes more sense. No model will be cheap to insure, but Lexus has an outstanding reliability record. Used values are poor, with the hybrid expected to plummet in value. Inside is where the Lexus LS excels. Its interior is comfortable, quiet and refined, and the ride is smooth as velvet. It’s a relaxing place to be. Especially if you go for the hybrid model, you won’t be bothered by any wind or road noise. It’s virtually noiseless in electric-only mode. Legroom and headroom are good, but the former is particularly generous. It’s that big of a car that you can opt for the shorter wheelbase version and still be satisfied with the space on offer. The boot is sizeable, too, and measures 560-litres. That’s the biggest in this list, which just adds to its usefulness as an executive car. However, it’s worth bearing in mind that the hybrid model gets a smaller, 420-litre boot. It’s also worth mentioning how generous Lexus are – as ever these days – with their standard equipment. Included in the LS Saloon’s list price are electric rear blinds, voice-operated sat nav, as well as air conditioned seats. As a result, there isn’t much left on the list of optional kit, which can only be a good thing for those of us who get carried away! In English, this car is called the Maserati Four Door. Kinda takes the shine off it. In Italian, it sounds deliciously Mediterranean. In keeping with such an exotic flavour, this is a swashbuckling car that’s big on luxury and power. Two things many of us crave. The Maserati Quattroporte is one of those truly magical cars that somehow make life that little bit better.